Today we are so delighted to feature a guest post from the Disney Insider! As the wolf crept by me, cautiously curious—we locked eyes for a split second. He had fantastic yellow eyes and a creamy white coat. I’d found a certain level of security during my brief adventure by humbly sitting in the back of the group. Every bear that walked by would have to clear the cameraman first before getting to me, right? But the wolf, he was different. He came around the back. So it was just the two of us (as far as I was concerned). He looked like a big dog, eager for a cuddle. Then he yawned, and my, what big teeth he had. What? Leave my family behind to trek to the middle of nowhere to follow a bunch of filmmakers while they seek out bears—on purpose? I wasn’t really worried about the bears. I respected them—in the way we should all respect wild animals—particularly those with sharp teeth and claws. What concerned me more was my fear of The Filmmakers—this elusive bunch of humans who make their living wandering among wildlife. Their way-cool world is so unlike my cubicle-bound, what-will-I-order-for-lunch existence. I was pretty sure they looked good without makeup (figuratively speaking), and I was afraid I wouldn’t be able to keep up with them. Would I be miserably cold and count the minutes till we could return to camp? Camp? Where would I sleep? Where would I … do other things that one must do several times a day? 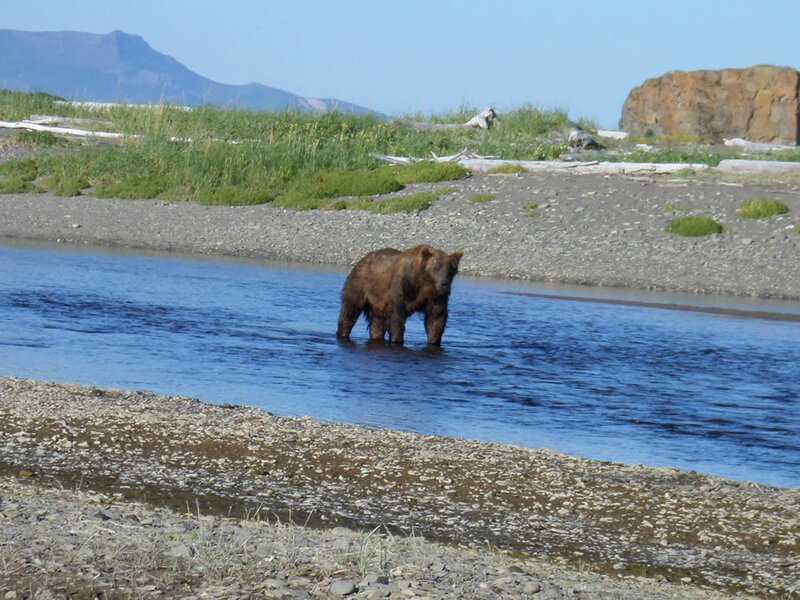 The trip to Hallo Bay Camp within Katmai National Park and Preserve was an adventure itself, culminating in a 75-minute jaunt aboard a Cessna that landed not on a runway, but a beach. I rode shotgun in this tiny aircraft and figure it was at least 20 minutes before I was able to unclench. 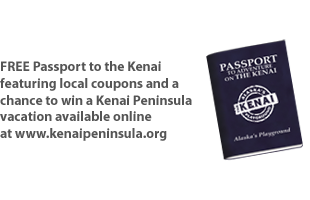 We flew from Homer over Katchemak Bay, which is where the Bering Sea meets the Gulf of Alaska. The area is home to active volcanoes and glaciers. It is untouched and incredible: a living painting of greens, blues and browns like I’d never before seen. I saw my first bear before we even landed. He was walking up the beach, a greeter sent to welcome me to this faraway land. As obviously natural as it was—this lone bear ambling along the coastline—I found it entirely foreign, since in all of my years on Earth, I’d never really seen an animal of that size and power free to roam for miles and miles. It was breathtaking and oddly emotional. And, it turned out, The Filmmakers were nothing to fear. 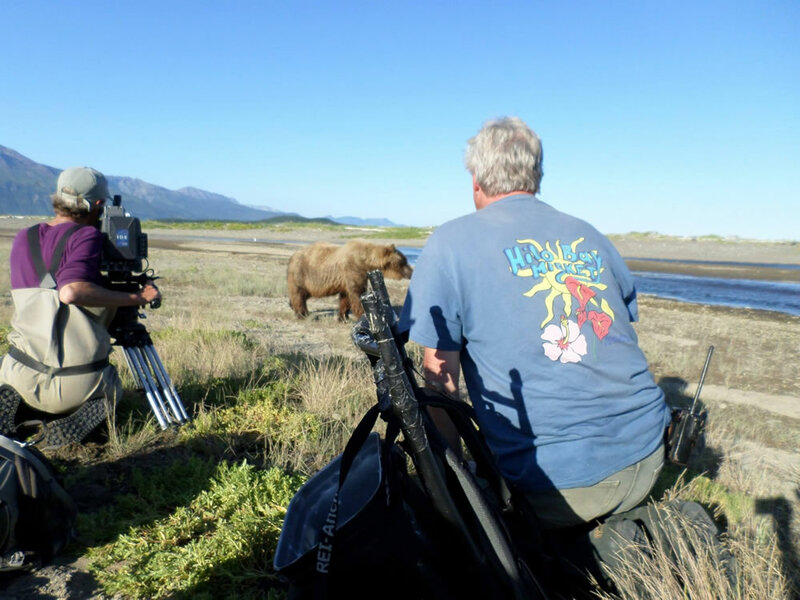 These charming Brits—led by director Keith Scholey—were a welcoming bunch, much like that bear—and they seemed eager to share their wild world with my rookie self. I sensed their enthusiasm ratcheting up a bit with my arrival. After all, their mission with a film like “Bears” is to bring their world to people just like me. Scholey and I set out with naturalist guide Simyra Taback-Hlebechuk to catch up with the team who’d been out filming for most of the day already. We hadn’t been walking for more than 10 minutes when Taback-Hlebechuk told me there was a bear munching on sedge grass up ahead just off our path. He was huge—easily 650 pounds—fluffy, the color of caramel and not the least bit interested in us. My heart raced, but I wasn’t afraid. Surely, he could turn our way and in a matter of seconds plow me over if he chose—but to him, I did not represent food. Bears don’t associate humans with food in this part of the world, which is why it’s possible to share their space. I’m not sure what I expected of Alaska’s weather—even in late July—but balmy was not an option I’d considered. Yet, the sun was shining and I was comfortable in a long-sleeved t-shirt as we walked a mile so down the beach dotted with driftwood and pumice stones, through a meadow and along a creek bed to join camerawoman Sophie Darlington, a field assistant and their guide. They were remarkably happy, considering there were no bears in sight. 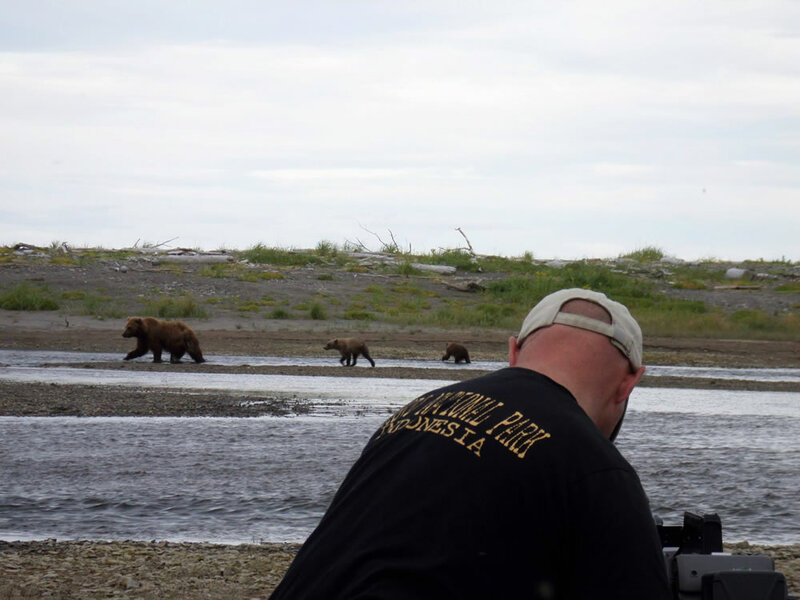 I got a taste of life on location, where patience is key and creativity is essential when it comes to passing the time (bear-orizing songs: “All the bears are brown …” and the group favorite, “Bear-hemian Rhapsody”). The protocol was simple, but surprising. We went to a spot where bears frequent—and sat. “The bears will come,” they said. And they did—four at once, actually. Our guide and the filmmakers recognized individuals—one was called Rice Krispy Ears, for obvious reasons. 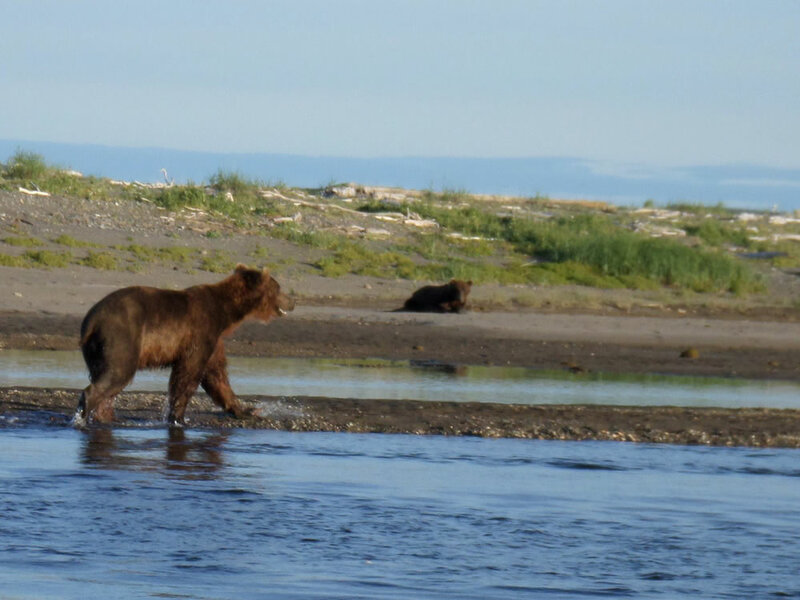 The bears disregarded us for the most part, but there were two that came quite close—perhaps to get a good look at the new girl, more likely because it was too much trouble to alter their paths. It wasn’t fear I felt, rather a profound vulnerability—punctuated by the fact that we were sitting as these 400 to 700-pound animals were lumbering by. I knew better than to run—no need to be mistaken for prey—but I had a great deal of trouble giving up all control. Note to self: control is overrated. 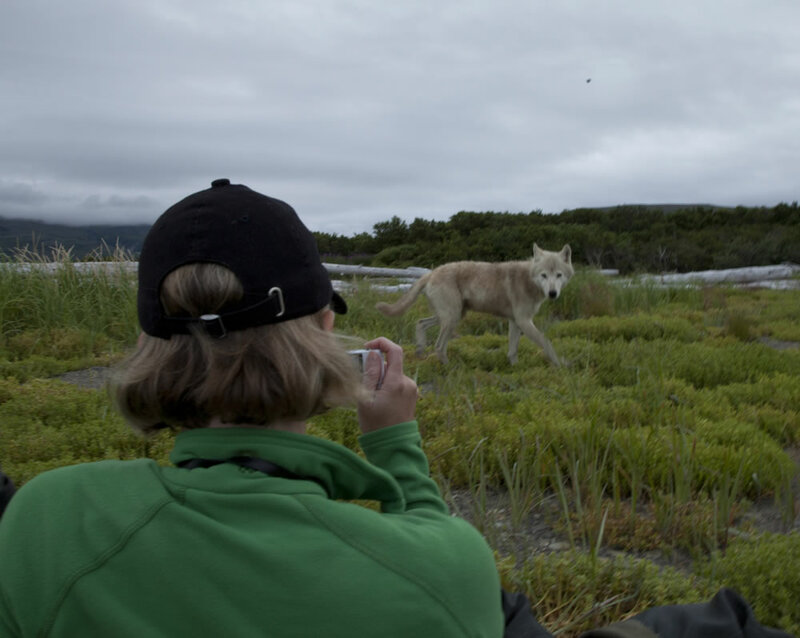 We saw two wolves that night; one curled up for a nap about 20 yards away—a fact that still seemed to titillate the filmmakers who hadn’t really witnessed wolves this unguarded anywhere else in the world. An eagle flew by—its grace and majesty was palpable. It was sensory overload at its very, very best. The sun was still out at 10 p.m.—it was summertime in Alaska, after all, but the light had waned a bit so the team packed up for the night. I was struck by the reluctance of the production team to leave the dirt and driftwood they’d called home for some 14 hours. They were genuinely afraid of missing something—THE shot—and since Darlington was leaving the following morning after weeks on location, she was visibly sad to bid adieu to Alaska. I admired her passion—a quality I noted in each of the filmmakers I encountered. Despite the day’s successes, I had not yet met mama bear and her cubs. But nature will not be directed, and—I found out later—Scholey was fairly sure any mother with spring cubs would’ve already left the area to steer clear of larger males moving in for the salmon that had begun to arrive. But I would not be disappointed. We were on the beach awaiting Darlington’s airborne chariot when we saw walking confidently up the beach a trio of beautiful bears. The whole camp erupted—apparently nobody thought I’d get my cub sighting. But there she was: proud mama with two cubs in tow. Even better: following Darlington’s departure, cameraman Gavin Thurston scrambled to gather his equipment, and I was invited to join the team as they went in the direction the little family was headed, presumably to fish at the creek. Mama bear reminded me of myself a little: multitasking, one eye on her cubs, the other on the job at hand. The scene was more entertaining than any reality show I’d seen to date, only to be interrupted by the lone wolf who came to check me out. Our guide estimated he came within 10 feet of me (though I was told I could say 5). And I didn’t think my heart could race any faster till I saw that wolf cross the creek where the mother bear was still hanging with her cubs. Wolf hunting was definitely not on my list—particularly if my newfound cubs were on the menu. With the permission of our guide, we hastily crossed the creek to capture what happened next. The wolf was not shy about his intentions. I waited for mama bear to put him in his place, but after one warning, she seemed preoccupied with her fishing. The wolf was relentless, and I was afraid he’d get a hold of one of those cubs. Shame on me for doubting that mother, who clearly knew what she was doing—those cubs promptly took matters into their own paws and let the wolf know they were in control. Best. Moment. Ever: two tiny cubs chasing off a wolf, not once, but four times—all caught on camera and a scene that would ultimately make the final cut—which says a lot considering more than 400 hours of footage was shot. I made a mental note on the spot to remember to let my own cubs stand up for themselves when the day comes (and it will). Bears is now playing in theaters nationwide. See the film during opening week (April 18-24, 2014) and Disneynature, through the Disney Worldwide Conservation Fund, will make a contribution to the National Park Foundation, the official charity of America’s national parks, to protect wildlife and wild places across America’s national park system.